Ahmad Greene-Hayes is a doctoral student in the Department of Religion at Princeton University, and an interdisciplinary scholar pursuing graduate certificates in African American Studies and Gender and Sexuality Studies. His research interests include Black religion(s), African American Pentecostalism, Holiness Movements, Gender and Sexuality in Black churches, and 19th-20th century African American and Africana religious histories. 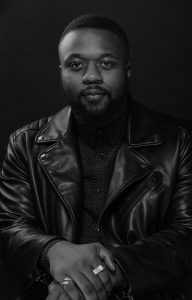 He is the past recipient of fellowships and apprenticeships from the Mellon Mays Foundation, the Schomburg Center for Research in Black Culture, and the Creating Connections Consortium (C3) at Columbia University. During 2017-2018, he held the LGBTS Research Fellowship at Yale University, and he currently holds the Religion and Public Life Fellowship from the Center for the Study of Religion at Princeton and is a Ford Foundation Predoctoral Fellow. In addition, he is an essayist and his public commentary on issues of race, gender, sexuality, Black politics and religion have appeared in The Black Scholar, Ebony, The Root, The Feminist Wire, the Huffington Post, Open Democracy and News One, among many other outlets. He is also the creator of #BlackChurchSex on Twitter, a progressive digital conversation on gender and sexuality in the contemporary life of the Black church, and he helped plan the #BlackChurchSex convening—“Love Thyself: Black Bodies and Religious Space”—co-sponsored by Princeton Theological Seminary’s Office of Black Church Studies and Columbia University’s Center on African American Religion, Sexual Politics and Social Justice. Follow him on Twitter @_BrothaG.